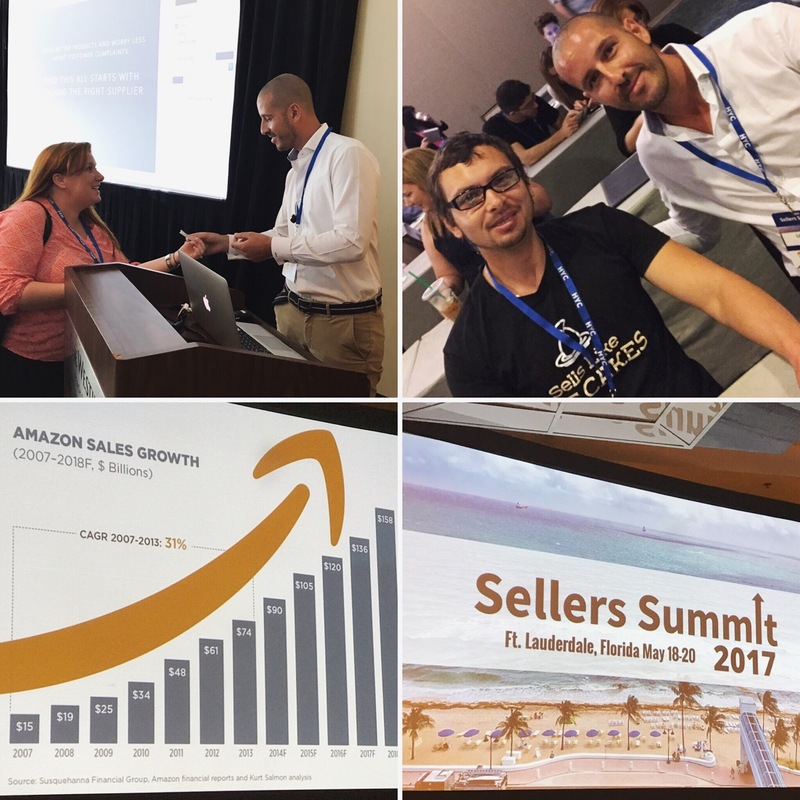 The biggest Amazon sellers summit in Miami came with a lot of perks. I was able to meet the movers and shakers of the e=commerce industry, people like Greg Mecer (creator of the Amazing Jungle Scout Pro Software), Scot Voelker (creator of the Amazing seller podcast) and many others..
Watch the video here to get the full gist! Can you guys review my Shopify store and give suggestions? Sure Chuck, go to CRITICS section! Glad to see you are all rocking! I am hitting 20 units sold per day this week. EXCITING STUFF! Just wanted to share! If you doubt - time to START! JUST DO IT! you rock LOU! thanks for all the help to the community! Great stuff lou! Keep up great work! I am planning to reach $150 profit per day next month. Good to hear, good for you! i am just starting is it late? It's never too late. It's a perfect time actually to start Shopify and Amazon FBA! GOLDEN TIME! I agree with Lucy, great time to start is NOW! Would love to hear your suggestions.. How tto optimize the shopify site for speed? USe the image compression app! Called IMAGE OPTIMIZED. It's good. Your goal is to sell 10 units per day, $10 per unit profit. You are on the right track, keep pushing! Hi everybody, I'm new here and is excited. I'm just looking at the Course Intro. I'm starting with ZERO and will keep you guys posted. Hi William, great to have you here!! I'm sure you will love it. Share your progress with us! I think it does not matter if all comes same or not. People are not expecting all products to be in same pack these days, you know even with amazon many times the products are shipped separately even if you order same day. I agree it's not a problem. If customer asks you reply that you ship from different warehouses. How about www.virtualoffice.com vs www.usa2me.com? Is there same service for US address right? yes you can use those. Thanks.. Also I am preparing my first Amazon launch.. is it still safe to give away discounts for reviews. I just got my first Shopify store installed by following your videos and now adding the essential apps to boost the sales like you suggested. Great stuff, i am super pumped to start selling! What if the customer goes directly to aliexpress and buys from it? Truth is, it was not your customer on the first place. If the person savy enough to know about dropshipping and aliexpress method then he was not your customer in the first place. No point to worry about it. It's like worry about online pirates. People who always download cracked software are not your customers anyways, don't worry about them. Target people who are not aware of dropshipping methods and you will be just fine! 99.9% of people will never bother finding alternatives and going to aliexpress is the last thing on their mind. They might go Amazon in worst place but never aliexpress.. If they go Amazon, again, they were not your customer so don't worry about them. Some people tend do buy exclusively on Amazon Prime for example. Another tip... if you offer some sort of exclusivity or special deal then people wont be looking much for alternatives. I have many people ordering Dog Frisbi for example and wait 2-4 weeks just fine when they could buy it cheaper probably on amazon and get in 1 day using prime. There is room for everyone here and a huge marketplace! How to find and contact influencers on Instagram?? Try whalar.com, socialhype.co, influence.co, Buzzsumo ,Boostagram .. each can provide list. Also BrandSnob app. Also of course direct contact without third party tools on instagram! What app allows to share reviews on facebook? Where to get turnkey solutions for amazon coupon squeeze page? Check Amzpromoter, pretty easy to set up and build a list! Does dropshipping work? i worry about slow delivery times? who will wait 2-4weeks?? Dont be discarded about drop shipping there are lots of people have succeeded in drop shipping, my advice drop ship is good when you do it internationally. I have no problems with international customers. You can reduce the delivery time.. Try DHL, i pass the cost to the consumer, i find consumer will pay the xtra amount to get the instant gratification they seek in online shopping.. Or find domestic suppliers.. It is Ok to use AlieExpress - just make sure that your customers know about the delivery times and the reason is because all products are made to order and direct from the factory. Then scale up and move slowly to FBA once you know what sells best for your store and fullfill via amazon prime! How do i build a list? any tips? Please see the video we have about building a list, great tips there! You can not collect emails through Amazon's platform. it myst be build a list outside Amazon.. build leadpages page. Run a contest in your niche or giveaway, or free plus shipping offer and then collect emails in return. EASY! HI ROCKSTARS!!!! SUPER EXCITED! Today is my first $2000 day! I launched 2 months ago. It's spring & Summer product. (not hammock!) I'm very excited to see more! Well done gus... the best is yet to come! like in a song! Inspiring stuff. Thank you for sharing GUS!!! Hi All, Im a beginner here. I have seen most of the videos. I am interested on doing FBA. I am from Australia and I just registered my business, applied for a seller account on amazon. Welcome Butz! Well... Just follow the lessons, pick the products and start the FBA business. Let me know if you have more specific questions! Great quetion from Nasim, i wanted to share it and then my response. "This course is really inspiring me to open my own store. Can you give me one more suggestion. From your experience which one you think is better a specific product type or mixed product stores? " There is no specific answer to this. You know Amazon itself is "everything store" and they are very successful. At the same time a lot of shopify stores are "one product only" or "one niche only". If you target specific niche (like pugs lovers, pug owners for example) then your store should have only products for pugs, because if they see the product for bulldog, they will be frustrated and leave). I hope it helps, but there is no RIGHT or WRONG way here. 1. If you go with "everything store" then research top competitor everything stores and make sure to sell similar products by similar prices. This will reduce chance of failure. 2. If you go specific niche, again use competitor spy tools and find out best selling products in competitor stores and duplicate them. great question, thanks mike for sharing the tips. to Nasim good luck! !